*Please note: Living Values Education's educational resource books for young people at-risk are only shared with educators/facilitators that have taken the full Living Values Education at-risk training for that particular population. explore how to optimally facilitate the process of young people exploring and developing values. Living Values Education has a cadre of trainers on every continent. They are a unique group of people – professional educators who are dedicated to helping young people grow toward their potential in safe, caring, quality learning environments and committed to "living the values." Living Values Education trainers volunteer their time to promote the understanding of values education and to help others explore the underpinnings of, and the skills to develop, a values-based atmosphere. Part of Living Values Education educator excellence is viewed as modelling the values, respecting student opinions, and empowering children and young adults to enjoy learning and implementing values. There are a variety of Living Values Education professional development workshops and seminars around the world. Living Values Education Training is recommended in order to implement the program most effectively – and help children and youth, and ourselves, move toward "living values". Cost: Living Values Education trainers lead professional development seminars and workshops often in a voluntary capacity. In most countries, hosting organisations requesting the workshops pay the costs of trainers’ travel expenses and any onsite expenses. Participants can be charged a fee to pay the trainer for the training provided. In some countries, individuals and organisations kindly donate funds to the national Living Values Education entity, be it an ALIVE Associate or Focal Point for Living Values Education, when training is given on a voluntary basis. Educators in Non-Formal Settings: day care centre providers, youth workers, girl and boy guide/scout leaders, etc. Living Values Education Educator Workshops and Seminars are experiential. Participants are asked to reflect on their own values, offer their ideas on elements within a values-based atmosphere, and imagine an optimal classroom environment in order to reflect on emotions, attitudes and behaviours behind quality teaching methods. What methods allow us to create a values-based atmosphere in which all students can feel respected, valued, understood, loved and safe? Living Values Education’s Developing Values Schematic is explored, demonstrating a clear model about how to help young people explore and develop values in today’s world. After they share their ideas, Living Values Education's theoretical model and the rationale behind the variety of values activities are presented. The workshop then turns to skills for creating a values-based environment. In a regular workshop this includes: acknowledgement, encouragement, and positively building behaviours; active listening; conflict resolution; collaborative rule making; and values-based discipline. These sessions are intermingled with small group sessions in which participants take part in Living Values Activities for children and youth. Living Values Education Educator Workshops and Seminars range from two to four days. Four day workshops are highly recommended for adults not familiar with conflict resolution and/or child-centred, participatory teaching methods. These workshops are for those who wish to become Living Values Education trainers. Participants should be professional educators; teachers, teacher trainers, education officials and psychologists who already have existing skills in training adults or facilitation groups. Ideally, they will have already taken an Living Values Education Educator Workshop and used Living Values Activities with children and/or young adults. A Living Values Education TTT provides the opportunity for participants to see and experience the exact sessions involved in a regular Living Values Education Educator Workshop. Additionally, the Living Values Education Educator Training Guide is introduced and the rationale underpinning the training process is explained. Other sessions include the theoretical background of Living Values Education, research which supports values/character education and Living Values Education at the international level. TTTs are usually five days in length. The brevity of the training does not allow for development of facilitator skills. TTTs for the young people-at-risk materials are two or three days longer than the at-risk training. Experienced parent group facilitators are the intended participants for this workshop. 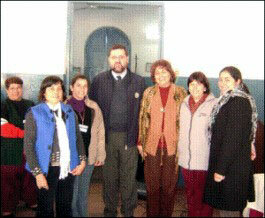 The workshop is similar to the Living Values Education Educator Workshop. However, there are a few additional sessions about the Living Values Parent Group process. Many of the activities participants will later do with parents are taken from the Living Values Activities books while some of the parenting skills are similar to those taught during the Educator Workshop but made applicable to parents. In the additional sessions they become familiar with the structure and process in Living Values Parent Groups: A Facilitator Guide. A few parent group sessions are also simulated. Read more about Living Values Education’s program for children in difficult circumstances – Living Values Education for Street Children Read about a recent research study in Paraguay, implementing LVASC with hundreds of children and outstanding results. Living Values Education offers a special training to educators, counsellors, probation officers, drug counsellors and personnel at juvenile offender facilities to learn to implement Living Values Activities for Young Offenders (LVAYO). This professional development workshop incorporates the elements of the regular Living Values Education Educator Workshop and adds sessions to practice skills and do the activities particular to this particular resource. This is designed for teachers working in schools or refugee camps with children affected by war. Living Values Education offers training to to implement Living Values Activities for Refugees and Children Affected by War (LVARCAW). It is essential that educators receive this training prior to doing the program with children. Because most educators working in camps or schools in formerly war-torn areas have been subjected to the effects of war, the workshop is deliberately long in order to begin to engage them in a healing process and develop trust in the process. Living Values Education training for the LVARCAW program begins with a welcome, the purposes of the program, and introductory activities. Teachers are asked about their concerns, and in light of previous discussions with organizers, the program is shared in relationship to their particular circumstances. 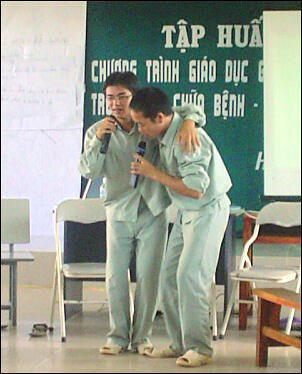 Teachers then participate in values awareness sessions. Sessions on active listening take place early in the training, and continue almost every day of the full ten-day workshop. The educators discuss the teaching methods and attitudes that create a learning environment in which students feel loved, valued, respected, understood and safe. Teachers are then engaged in several activities that are in both LVARCAW and regular Living Values activities for children. Living Values Education's theoretical model and the rationale behind the variety of values activities are presented. Several days into the program, Living Values activities that deal with war in the LVARCAW unit are introduced. 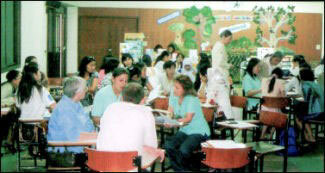 The teachers are divided into small groups. 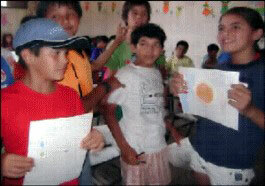 They participate in some of the activities, are told about others, and teach the activities by the end of the training. It is important for all of the teachers to go through the lessons to understand how the process works, not just intellectually but emotionally. While this model is not that of a "talking cure," it allows people to express their feelings about war and those who are missing or have died. Hence, some of the sessions can be emotional or elicit strong emotions. The activities are designed with supportive elements and participants engage in expressive activities through drawing, puppets, sharing, relaxation/focusing exercises, and traditional songs. In one of the activities, factors leading to war are discussed; participants real concerns are engaged. The training provides additional sessions to develop skills for creating a values-based environment. This includes acknowledgement, encouragement, and positively building behaviours, conflict resolution, collaborative rule making, and values-based discipline. How Can I Contact An Living Values Education Trainer?